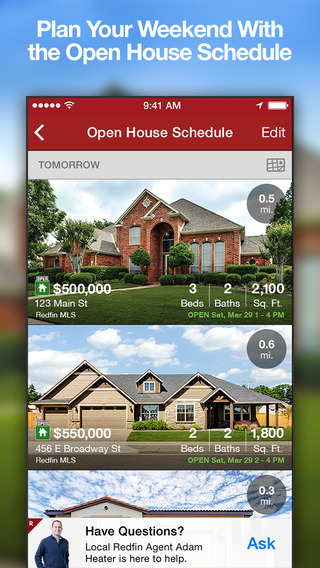 Real Estate by Redfin is a free real estate app that is available on the iPhone, iPad, and iPod touch. In addition to being free, there are also no in-app purchases or advertisements. The visual map has circles for each neighborhood, along with a number inside each circle indicating the amount of homes for sale in that neighborhood. Once you tap on a neighborhood circle, the map will zoom in and show you individual homes which you can tap on to view details. The details pane shows up on the bottom of the page, so you can still see the rest of the map. But if you want to see an extensive list of details, you can just tap on the bottom pane to enlarge it. From there you can see the home’s price, monthly mortgage, bedroom and bathroom numbers, square feet, information, images, and other key details. You can ask the home’s agent a question from directly within the app, as well as add your own notes and photos of the home if you visit it. Not to mention that the home can be shared, favorited, and un-favorited. If you have a question about the home and need assistance right away, there’s even a phone number you can call for that specific home sale. You can also schedule a tour from within the app. For users that don’t like using the map for finding homes, they can opt to use the “list view” instead. 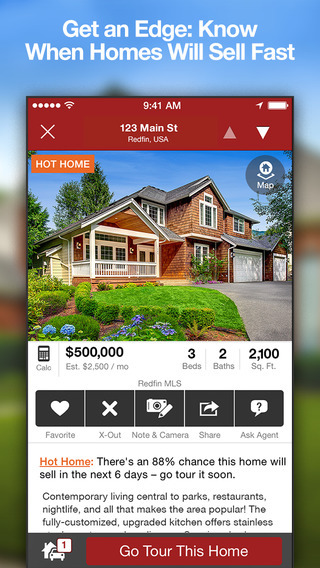 Finding your dream home based on budget and needs is a breeze with this app. It does everything from filtering homes in your desired area, and showing you only the ones you’d be interested in, to connecting you with agents and scheduling tours. Everything about this app is great, except its name. It might be a bit confusing to tell your friend to “download the Real Estate app” since there are just so many out there on the market. Telling them to download “Real Estate by Redfin” is just as confusing. If this app had a unique name it would go a long way in its branding. But you probably won’t worry about that if you’re just looking for an effective real estate app. If you’re looking at buying a home and want to get an idea of the market, tour homes, and find exactly what you’re looking for, then Real Estate by Redfin is a must-have. This app is extremely useful and it’s also free! Rated: 4.5 by 375870 customers.